The community of Rancho Cordova had experienced several armed robberies in early January 1988. On January 20th, a fast food restaurant on Folsom Boulevard had been robbed by a gun-toting suspect. On January 21st, Sergeant Richard Deffner was commanding the Sheriff Department’s Special Enforcement Detail (SED) Gold Team in an all-day search in an attempt to locate the violent robbery suspect. At approximately 2:15 p.m., officers spotted the suspect’s car and gave chase. The suspect crashed his car into a fence and ran from his vehicle while firing shots at the pursuing officers. The suspect disappeared into the neighborhood. An intensive search began by officers, assisted by SSD K-9, and Sheriff’s Department air assets. An eight-block perimeter was established and a house by house search continued until it was terminated because of darkness. Several hours later, another direct confrontation occurred between the suspect and officers when he was seen hiding in a garage. He again fired at officers and fled to a public storage area near a large apartment complex. A perimeter was quickly established and the Gold Team was again called and assigned the responsibility to search within the area where the suspect was believed to be hiding. Sergeant Deffner realized that if the suspect was on the roof of the apartment complex, he would have a definite advantage over the officers below who were attempting to arrest him. Sergeant Deffner made the decision to search the roof with two of his team members. While on the roof the officers heard noises in a yard below. As Sergeant Deffner peered over the edge of the roof, he was shot in the face by the suspect. 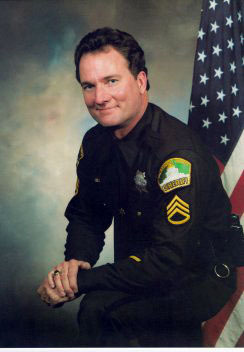 Sergeant Deffner died that night making the ultimate and final sacrifice for his community and fellow officers. Later, as the suspect was trying to escape he was shot and killed by officers. Sergeant Richard Deffner was posthumously awarded the Medal of Valor for “conspicuous bravery above and beyond the call of duty”. The gymnasium at the Sheriff’s Training Academy is dedicated and named for Sergeant Richard E. Deffner, who is buried at Mount Vernon Memorial Park on Greenback Lane. Sgt. Deffner’s SED call sign (91S) was retired from use by future members of the team and is proudly emblazoned on the SED logo as a memorial to past, present and future SED members and to the community which Sgt. Deffner proudly served. Make a donation to SACTAC today to help better equip your officers and protect our community. Stay in the loop! Sign up for the latest SACTAC email updates.